Difficulty Notes: Woodland Caribou is well off the grid. You should assume that you are completely on your own and must have the requisite survival skills and experience to live as such. Bringing a satellite phone or other emergency beacon is a good idea. One of my goals for the 2011 canoe trip was to make it feel like we were on a route we hadn’t done before, despite having done a very similar route in 2009. One way to make this happen was by doing it in reverse from our previous outing. I also added some variations – obviously these could be ignored depending on weather and other factors. A big difference between the 2011 canoe trip and any others we’ve done before (or since) was the length. After a very bittersweet feeling in 2009 after one of the wettest, coldest – and if I’m brutally honest – disheartening canoe trips, I was determined to make the 2011 trip better. I’ve always maintained that 5 days on the water simply isn’t enough time for me to fully disconnect from the stresses of everyday life and doesn’t justify the big expense in both travel and money that a trip from Alberta to Red Lake, Ontario costs. Another disadvantage of a 5 day trip is the weather. I’m learning over the years that WCPP has wild swings in its summer weather, from lows of almost 0 degrees to highs a few days later of 30 or even higher! We’ve had everything from cold sleet to brutal heat on the same trip and a longer time on the water is the only way to guarantee more nice days. Click on the header below to launch the Photo Album with labels. Packing up in Rod's basement. Does it fit now Hentie? We ate breakfast in Vermillion Bay. 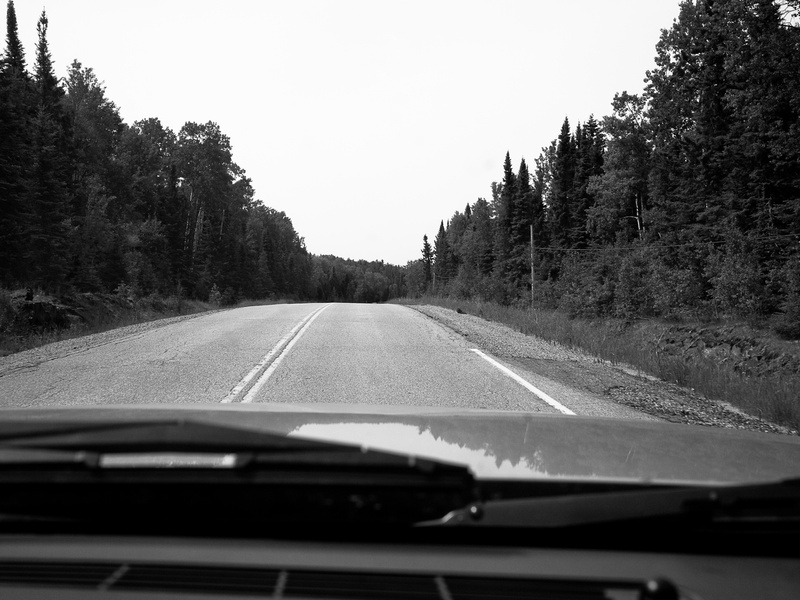 A long drive up to Red Lake from Vermillion Bay. Just finished a hot chicken sandwich at Montana’s with Mike and Harry as we prepare to fly to Manitoba. We’re ready to go through security and board our flight. We had a good takeoff (bit bumpy) and we’re now officially on our way to an epic canoe trip! It’s still a bit hard to comprehend that we’re actually on our way after all these months and months of work and planning and dreaming about it. We have been doing these trips for a long time but never one quite like this. We were chatting about our first trips with garbage bags for rain coats and beer cases being hauled over portages. We remembered trees falling (or being pushed over) and skunks in tents. A political discussion on Pakistan is currently in the works between Harold and Mike. Day 1 Map. We preferred Camp 1 but ended up enjoying Camp 2 as well. A familiar road now – this is the Leano Lake road to the parking lot – almost there!! We’re off. There’s always a wonderful feeling of anticipation in the moment before you first plunge into the bush. After about 50 mosquito bites the feeling wears off. I remember this moment clearly. It’s hard to believe how fast time goes and we’re standing back on familiar shorelines. One of a few small portages on the way to Kilburn – I believe this is the final 100m portage coming into the lake. Finally – we’re on Kilburn Lake. I’m sitting by a roaring fire. Mike is getting the walleye filets ready. It was a beautiful day today and the night is gorgeous. There was no wind as we paddled into Kilburn Lake. The portages were in great shape, a bit muddy but not bad at all. Setting up camp and figuring out how things work in the bush again. An amazing first evening with a blazing summer sun and glass lake surface. This is the best way to start a 10 day trip! The funniest part is that I’ve honesty lost count of the number of fish I’ve caught already! Even funnier is that the vast majority of them are walleye. Kilburn Lake is a walleye factory. When we had to find a new campsite 3 km past our preferred (and occupied) one, I cast a jig and caught 5 walleye just off our new camp in 5 casts! Within minutes I had a dozen walleye. We set up camp and had supper. After supper we went for a fishing excursion but weren’t really that motivated to actually catch anything. Rod and I just sat there and listened to the sounds of the lake – it was very sublime. Hammering walleye just out of camp. Now we’re all sitting around a cheery fire, eating fresh walleye and listening to a pair of loons off somewhere on the lake around us. Their haunting cries echo off the hard rock of the Canadian Shield. It feels like we’ve been out here for a few days already, which is kind of like getting 2 days for the price of half a day! The sun sets on our first day. It always feels surreal to finally be out on the water. The guys in Red Lake were super nice and chatty. We had to give some strong hints that we’ve waited two years for this trip and wanted to rock ‘n roll as quick as possible. The drive was great too. Everything has gone perfectly so far. Considering I was awake already at 02:30, I think it’s time to hit the sack. Phew! What a morning I’ve had already! I woke up at 04:30 and couldn’t get back to sleep. When I heard a canoe moving outside I decided to get up and check it out – Hentie was up and at ‘er already too! As I stood there trying to decide what to do next, I heard consistent splashing noises somewhere down the lake from camp. I loaded some fishing and camera gear into a canoe and paddled solo towards the noise on a lake of glass. Hentie is already in the boat at 04:30. Hentie and I were the early risers for the entire trip. A cow and bull moose were feeding in the marshy area across a bay about 1 km from camp. I’ve never seen moose feed this way before. They would submerge themselves completely into the water for about 1 minute – eating like crazy from the bottom – before raising their heads for a breath. Every time the bull would raise his head, there would be a lot of splashing due to his giant set of antlers. I photographed and videotaped them for over half an hour all by myself in a gentle morning fog with birds chirping and serenading us. A bull moose comes up for air after feeding on the bottom of the lake. The cry of a loon is always proof for me that I’m really on vacation. I did some halfhearted fishing on the way back to camp and caught another dozen walleye. It’s a beautiful morning now, the sun is almost hot already. We have a short day today, there’s lots of exploring to do! Day 2 map detail. We paddled from ‘Camp 2’ to ‘Camp 3’ and then explored into Upper Kilburn Lake via the green path. Back in the boats – headed for our Middle Kilburn camp. You can always tell when it’s hot because we start dangling our legs in the water every time we stop paddling. Already at our Middle Kilburn camp. That didn’t take very long. Enjoying a coffee near camp. We’re at camp already, eating a nice lunch in the breeze and warm sun on a pointy island in Middle Kilburn Lake. We’re actually roasting in 25 degrees, but nobody is complaining. We were initially laughing at how easy today would be but then we spent about 2 hours looking for the one trail we needed! Mike and Harold apparently thought the moose were using blazes on the route they initially found, so we went on a wild goose chase looking for it somewhere else. I’m sitting on a warm rock above camp. I have a grape flavored Backwoods cigar lit up and some instant Via Starbucks coffee sitting on the rock beside me. It’s been a great first full day in Woodland Caribou. After setting up camp and eating lunch we went exploring into Upper Kilburn Lake. The fishing wasn’t that great, especially when compared with the main lake but after a slow fishing period we got into a long, narrow bay. It was here that Hentie caught the biggest walleye I’ve ever seen. I love these little flowers and all the flora in WCPP that scrape a living out of the harsh landscape. Rod actually managed to haul in a lake trout and I managed a few medium sized pike. We enjoyed sunshine and a breeze on our backs on the way back to camp. Now it’s time to feast on walleye and lake trout. I always bring too much food on these trips. I couldn’t even eat my supper meal today, snacking on fruit bars, jerky and granola bars keeps me fueled – not to forget the peanut butter and honey, mini-bagels and wraps with fish! Wow! It’s an oven in this tent! Oh well. Better than wet. It’s time for bed after two nights in a row of 4 hours of less sleep. Hopefully I sleep a bit better than last night. We’re pretty much packed up and ready to go already. It’s a dead-calm, beautiful morning. Birds are chirping energetically, Mike and Harry are packing their tent and the rest of us are eating breakfast. I have the feeling that today is going to be a real scorcher. Wow! Another perfect day dawns at our Middle Kilburn campsite. This is certainly making up for the 2009 debacle. There is humidity in the air and it’s so dead-calm that the surface of the lake is absolute glass-smooth. The sky is kind of breaking up over the horizon. I can’t get over how light it is already at 04:00 and even as late as 23:00 out here. It’s awesome how long our days can be with that kind of day light. I’m looking forward to today’s adventures. Day 3 detail. Note the “Shallow” area which can be interesting to navigate. Pulling over an obstacle on the Talon River. Most sections of the Talon River are excellent paddling. My absolute favorite flower – the Iris! You need patience and tenacity to get through these sections. We’re sitting on Boomerang Lake in the hot sun, eating lunch. We all jumped in for a dip after negotiating the tight creek from Dragon Lake (where we got lost coming the other direction in 2009). The portages have been getting a bit tougher since Kilburn since less traffic goes through here. Talon will most likely have some moderate sized waves since the wind is now stiff from the west. All I know is that right now my cigar and coffee are going down really well. Lazy summer paddling on the Talon River. Another favorite of mine – the woodland lily. We’re on an island in Talon Lake and have set up camp for the next few days. Our location is awesome. The sun is back out after flirting with some thunderstorms that passed us by. The wind is fairly strong from the west, I have waves splashing up against my feet right now. Today was a tough, but reasonable, one – we made camp by 16:00 and had a nice long break. There is nobody else around me right now. A few turkey vultures are circling over my head and I’m out taking photographs of wild flowers. It’s a good day. The usual camp detritus as we set up. This is much less casual when the weather is bad! Our camp on Talon is awesome. I am in the tent while the others are still sitting around the fire. I’m feeling a bit tired after getting very little sleep the past few nights. It’s a bit cooler tonight so that may help. The mosquito army is trying desperately to get in the tent but so far I’ve managed to keep them at bay. It feels so good to relax after a long day in the boats. Especially when the nights are dry and warm. After supper Rod and I left camp around 19:00 to some fishing and puttering around. We caught some decent size pike and I even caught a very nice lake trout – it was a very dark color. I caught it on a shallow diving Rapala which was kind of weird for a lake trout. Today a lot of the guys felt tired from the work but I didn’t find it too bad. After clouding up, the sky cleared off again tonight so we’ll see how tomorrow shapes up. It should be a good day, with the full day spent on Talon and no changing of our camp. I can hear the fire crackling the low voices of the guys around it. I miss Hann and the kids already. I’m sitting on a rock in Talon Lake early on Sunday morning watching gentle waves lap at the shore while a warm sun rises on the horizon and kisses my face with it’s rays. The natural world is such an amazing thing. It was raining this morning when I first awoke at around 06:00 so I slept another 20 minutes before getting up. Enjoying the waves lapping at my feet as the rest of camp sleeps in on a rest day on Talon Lake. Today feels like a great day. Only Hentie and I are up (this is becoming a morning trend) and he is studiously trying to fix his crappy Canadian Tire camp chair which has already fallen apart on him… It’s so much easier to connect with the natural world out here than when I’m buried in the concrete jungle back in Calgary. I’m starting to realize that a large part of humanity’s stress is caused by our constant fight against things over which we have no control. I have to resolve to fight less with my world and simply accept what I cannot change and embrace what I can change. Right now I’m sitting on a rock in south Talon, enjoying lunch and a conversation about RPG’s (don’t ask). We’ve been catching decent sized pike in bays along our route and are now heading back to camp. We enjoyed a half day excursion to south Talon on the cloudiest day of our trip – the perfect day for a layover. A few rain drops are falling as we prepare supper. We had a great day on Talon. The fish weren’t exactly attacking our hooks, but when they did bite on they bit hard. I caught another lake trout, which is the 2nd one I’ve caught in Talon, and it was also very dark compared with other one’s we’ve caught in WCPP. An incredible post-storm sunset on Talon Lake. The weather was a bit strange today – we all got sunburn even though it seemed cloudy most of the day! 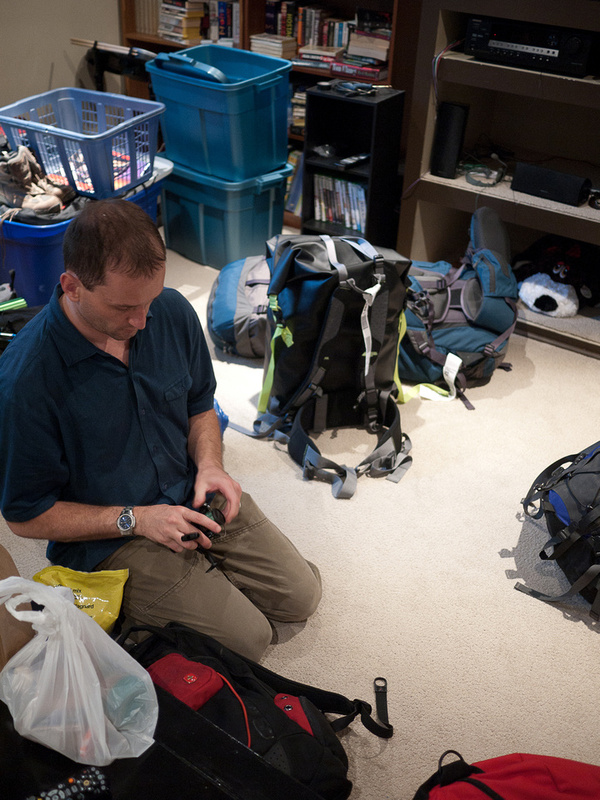 Tomorrow we hope to go around 20 km or so – into Welkin Lake. A highlight of the day will be finding the 550m portage out of South Aegean as it’s not considered a very straightforward trail. It just finished raining and we were treated to an extremely beautiful double rainbow and sunset. I was looking at pictures of Hann and the kids on my camera and realized I miss them already. An incredible full rainbow on Talon Lake. We are all packed up and ready to start our day! It was more work than usual to break camp after getting good and soaked yesterday evening. We have a very nice day ahead of us today, paddling into Aegean. I had my best sleep of the trip last night even though I did dream of work. Haven’t thought about work for at least 4 or 5 days now. I hope I don’t bring it up again on this trip. I can’t believe how calm the water is again today. Something not to be taken for granted out here! We paddled through some really neat terrain features between Talon and Aegean Lake. We’re having lunch in South Aegean just before an 80m portage into Aegean. What a beautiful morning we’ve had! There is zero wind and it’s 18 degrees – absolutely the most perfect paddling conditions you can get. We’re moving along in our boats, paddling past rocky outcrops, serenaded by loons and having our senses rocked with the wild beauty all around. I’ve never seen so many Iris’ flowers as this year so far – they’re absolutely everywhere we look! We aren’t catching very many fish today – it’s probably too cool after yesterday’s cold front moving through. On a day like today, when we’re paddling quite far, it doesn’t hurt to have less fishing action. Cliff scenery along the Bird River. A nice rest stop in Aegean – a beautiful lake with many islands. We’ve just finished eating supper at our delightful camp on Welkin Lake. The day was trickling along just fine until we approached the 550m portage from Aegean to Welkin. We passed from a mature forest to a fairly fresh burn just before the portage – it was remarkable how the burnt area just appeared from nowhere. We were warned beforehand that this portage could be tricky to find / follow which made it ironic that our trouble was the ease with which we found it! Sometimes expecting something to be hard makes the whole enterprise much more difficult than it would have been otherwise. This was one of those times. Our portage is just ahead – we just have to find it now. Harold and Mike were the lead canoe and emphatically declared the trail “found”. Their assumption was well founded because as we approached the burnt out shore there was very clearly a few cairns on the bare rock indicating the start of a portage trail. We landed our canoes and proceeded to charge through the burn area, following cairns along the rocky, charred landscape. The burn was very interesting to walk through and by “interesting” I mean “challenging” – especially with a large pack and arms full of gear. When we lost the line of cairns in a small swamp things got really “interesting”. When a sudden, severe thunderstorm smashed into us from nowhere as we struggled around the burn without a trail things got elevated to the “this isn’t fun anymore” level of interesting! Looking for the portage – which is located just ahead to the left here. We’re not feeling a sense of urgency yet because we don’t realize the t-storm that’s rapidly approaching! It must have rained at least an inch in 10 minutes as the (thankfully) small thunderstorm moved through. Lightening strikes were uncomfortably close as we did our best to stay dry during the deluge – a task made more difficult by the fact that most of us left our rain wear back in the canoes! Now that the burned area was soaked, we were slowly turning black the further we walked – still urgently trying to determine where the heck we got lost! We find ribbons – but where the heck is the actual trail?! Frustratingly hard to find. Harold doesn’t look convinced yet… This is just before the fireworks started! I finally found a line of pink ribbons tied around burnt tree stumps and fallen debris and followed them through a swamp that led to the edge of the burn and through a very wet area. When I reached open water on the far end I was delighted to have found a way through! Something was weird though. There were 3 canoes bobbing against a rocky shoreline near my exit. It actually took me a few moments to realize that these were our boats and I’d found the ‘official’ trail and followed it back to the boats, rather than forwards to a small lake between Aegean and Welkin. Now that we had a line of ribbons to follow, we managed to find the ‘route’ (it certainly wasn’t a defined trail) through a small draw and ending up at a gorgeous little bay on the other side. It was a tough portage because we were mentally exhausted at this point, soaking wet, covered in soot from the burn and stumbling around on the wet rocks while trying to negotiate around, over and through the debris. Canoe trips are quite simple in good weather with easy portages. It’s moments like this one that you must be able to deal with in WCPP or you could be in for a nasty surprise. After finally completing the toughest assignment of the trip we were faced with a difficult 2 km paddle directly into the wind before completing a very scenic 100m portage into the main Welkin Lake. Now we are enjoying a pleasant conversation on various topics from what Mike likes to eat, to politics, to voting methods and of course all of it leading to in-depth discussions on bodily functions of some sort. Thankfully the portage into Welkin from the finger lake was short and obvious – but steep on both sides! Descending into Welkin Lake with a canoe on our heads. On Welkin Lake, heading for camp 4 which is hopefully out of the burn zone. A view from just off our campsite, looking back at it. Note the edge of the burn area is right where we’re camped. Time for some reflection. I miss Hann and the kids – I hope they’re having fun and staying safe. A cheerful campfire on Welkin Lake. It’s a very calm, warm and gorgeous morning. I’ve been up since 05:00, paddling solo around the lake and taking photos. Welkin is not teeming with fish but it sure is a pretty place to call home for a few hours! As I paddled slowly on a glass surface, the fog was lifting all around me and a pair of loons was calling loudly to each other. I was looking for the 20m portage leading into Beamish Lake since we’ve come through Beamish from the Manitoba side before and I wanted to make the ‘link’ officially. The sun rises at around 05:00 over the mists of Welkin Lake. I think it’s gonna be a scorcher today! Loons in the morning mists. Contemplating life and purpose on a rock in Welkin. I spent some time fishing the falls running out of Welkin. Surprisingly there were no walleye to be had but I did catch 8 pike. It was a bit spooky being all alone, far from camp with the mist and the rushing water all around me. When I do my solo canoe trip I am going to have to get over the spookiness of being all alone out here. I’ve been purposely heading out on little solo paddles whenever I can on this trip to get a feel for how it’ll be when I finally manage to get in a (long) solo paddle (I finally did my first solo paddle in 2018 but it went differently than I expected). I think the biggest challenge for me is going to be dealing with the absolute solitude of this place. We haven’t met a single other person since Kilburn. I’m enjoying the silent stillness of this morning, perched on a small island that didn’t burn. I think I’ll try fishing for a bit yet before heading back to camp. Paddling through Welkin on an outstanding morning. I’m sitting on a rocky outcrop in Wrist Lake near one of the best campsites I’ve ever seen. We have fire rings, a great kitchen area, a sleeping area tucked away in old growth forest on a mossy carpet and tons of great fishing all around – this is heaven. This morning was great too. After my little reflection time on that rocky island I decided to troll a deep diving Rapala to the opposite shore just for kicks. Sure enough! A quick hit ensured me my first Lake Trout in Welkin. I quickly caught another, larger one and yet another lake trout closer to camp. Only one portage on the way to Wrist Lake along Beamish Creek – much easier when it’s sunny and warm. This is NICE! Beamish Creek bubbles happily next to the portage trail. Paddling out of Beamish Creek and onto a large and utterly still Wrist Lake. Our travel from Welkin to Wrist was awesome. Sunshine and a light, cool, breeze in our faces gave us a wonderful paddling situation. The burn ended at Wrist Lake, thank goodness because Wrist is one of the nicest lakes we’ve ever seen in WCPP with gorgeous old growth forests and many rocky cliffs plunging into clear water. Looking down at the camp kitchen area from on top of the island. This is the nicest I’ve seen this camp. Since 2011, I’ve stayed here a few more times. In 2016 it was completely dead from the pine beetles and fires in the area. Doing laundry at our Wrist Lake campsite. I nearly broke my ankle while being stupid and excited on a portage trail, proving yet again that there’s no room for error out here! Thankfully I ‘only’ sprained it – when I felt the tendons tear I honestly expected it to be a LOT worse. When I do my solo trip I’ll have to be much more aware of not taking stupid risks like this. We go exploring in Wrist. This sandy beach marks the start of the route to Hansen Lake which we took in 2014. This area is completely burned now, as of 2018. The dark mossy forest was perfect for camping. Every other time I’ve been to this site the forest has been too wet to set up tents! I’m enjoying another Starbucks and cigar moment, sitting above our kitchen area while photographing eagles who are doing their best to salvage what they can from Rod’s 20lb northern pike! Yep – you read that correctly. Rod pulled a giant pike out of a point on a bay near camp trolling a copper / bronze red and white Len Thompson lure behind our boat. We were fishing for lake trout when the bay got too shallow for our deep diving Rapala’s. We pulled out the casting rods and proceeded to catch a few smaller pike before canoeing back out of the bay to fish some deeper water. I mentioned to Rod that maybe we should have our lines in the water, in order to troll past the point between the shallow bay and the lake since I’d read that big Northern’s can be found in this terrain. Rod fighting his giant Pike. Rod agreed with the plan and as we trolled out of the bay his rod bent nearly in half and the fight was on! The fish actually pulled our canoe around for a while before I finally glimpsed what Rod had hooked. I nearly fell out of the boat when I saw a dark mass over 3 feet long! After some nervous moments I managed to finally heave the monster into the canoe and Rod could breathe again. Rod wins! I think we’ll let the next one go – we couldn’t even finish all the meat, it was too big. Hentie cooked up some nice Pike steaks for supper – good times! I’m hoping that after Hentie’s giant walleye and Rod’s giant northern, maybe it’s my turn for a giant lake trout soon! We left the fish carcass out for the eagles and gulls and now I’m taking some wonderful shots of the chaos that is nature consuming itself. The eagle at left is a young one which hasn’t developed it’s classic colors yet. A very nice evening at camp. I’m tired and a bit nauseous. My ankle is bothering me. Time for sleep. Wrist to Mexican Hat Lake detail map. I woke up around 04:45 this morning and Hentie was already up. We treated ourselves to some coffee while witnessing an incredible sunrise. Afterwards we headed out to fish and managed to land a bunch of small pike and some trout. Hentie caught his very first lake trout which was kind of cool. Today is windy with a mix of sun and cloud. We’ve been so lucky with the weather so far. Compared to our last WCPP park trip this is a dream-come-true. I remember wondering after the last trip in 2009 if I’d ever bother with another canoe trip – that one was so wet and cold! Of course, that’s why we’re on a 10 day trip this time – to give us more bad weather days. Well, we haven’t needed one yet. Today is a medium-sized day of canoeing before setting up for another 2 night camp, this time on Mexican Hat lake, hopefully right beside the walleye factory of all time. Paddling out of Wrist Lake. The campsite on Mexican Hat near the Walleye factory is pretty deluxe back in 2011. As of 2016 it was pretty damaged by beetles and nearby fires. I’m laying on my ThermaRest with the sound of a waterfall in the background and a gusty wind blowing over me keeping the bugs at bay. We have set up camp here for the next two nights. This is a dream camp, right next to a walleye ‘factory’ in the form of a long set of waterfalls flowing into a small bay right beside a thin peninsula of rock where we’re camping. I’ve already hauled around 20 fish out of the falls, casting right from our camp kitchen!! Looking off the point of our site with the Walleye Factory at right. We’re taking a siesta after a fairly strenuous paddle from Wrist Lake this morning. Our first two portages into Amber Lake were fairly easy with wide trails and dry conditions. We were wondering what the third portage would be like. In 2009 the portage from Amber to Nutria was a messy affair, this time it wasn’t bad, most of the boggy sections had dried up nicely. The tough part today came in the form of a shallow bog between Nutria and Mexican Hat which we paddled right through in 2009! Ahhhh. A muddy bog. No canoe trip is complete without one of these! On our way to Mexican Hat Lake from Nutria. The infamous bog from Nutria to Mexican Hat Lake. In 2016 Niko and I simply paddled through here – no problem! Our paddle along Mexican Hat to camp was also tough, we found ourselves fighting a fairly stiff wind. I remember when Rod and I found this area in 2009 after sitting out (yet another) rain storm at our desperate camp about 1 km west. We were paddling along and heard a waterfall. When we rounded the corner and spotted this camp we vowed to return some day and stay at it. Well – here we are! And we’re here for two nights. The camp is very well used – almost too used. Towering pine trees loom over our tent site. Sunset on Mexican Hat Falls. We’re listening to some cranked up music with a roaring camp fire, the sound of a waterfall nearby and the setting sun. What a great ending to yet another perfect WCPP day! We are planning to head into Glenn Lake on an exploratory trip tomorrow. I think I’ll try to get up for sunrise again tomorrow – but the sun rises very early at this time of year! By 05:00 the sun is already cresting the eastern horizon. Setting up for an evening campfire on Mexican Hat Lake. Looking down the falls towards our camp (blue tarp). A view off a rock shelf at the bottom of the falls, looking towards camp and over the ‘factory’. We’re perched on a lovely, rustic island in Glenn Lake after taking 3 short portages from our Mexican Hat campsite. It’s hard to believe but we’ve found better fishing here than anywhere else in WCPP so far! Harold is buy fileting 6 fat walleye for lunch while Mike cooks them up mere seconds after they are skinned! It’s an extremely hot and windy day and we are really feeling paradise out here now. Glenn is a wild, beautiful spot that sees very few visitors. We’ve been on our own since last week Friday – not running into a single other person since then! It amazes me how utterly devoid of people WCPP is – I really hope it stays this way for a long, long time. The canoe trip back to camp is going to be interesting in the strong winds we’re experiencing, hopefully we can simply ride the waves. The exit from the Mexican Hat Lake into Beck’s Lake and towards Glenn has a nice sandy beach next to it so we checked it out. As you can see, it’s a much windier day today than we’ve been used to so far on our trip. Fishing on the way to Glenn Lake – we hauled so many fish out of here it was nuts. Big walleye. I must have over 50 fish already today and will probably have another 50 by the end of it. I guess that’s why folks are willing to dish out $1000 / day for access to this country. Hansen Lake is connected to Glenn and has a fishing lodge on it. Time to eat some fish now. Looking down the second set of rapids / falls into Glenn Lake where the other canoes are already hammering large Walleye for lunch. We made it back safely. The wind wasn’t too bad and we paddled hard. Now we’re sitting back in camp after a very refreshing swim ‘enjoying’ the ferocious company of black flies and horse flies. Sunset over Mexican Hat Lake. A very nice way to end the day. I thought we were in for some wicked t-storms but once again they missed us. Wow. It’s blazing hot in this tent and extremely humid. I’m surprised we’re not being hammered by thunderstorms right now. I am getting ready to go home so I guess this trip has accomplished what it set out to do. So far it’s been an absolutely outstanding adventure from start to finish. This trip has more than made up for the crappy weather in 2009 – that’s a fact! I miss Hann and the kids – I keep looking at their photos on my camera. I’ve been up since 04:30. I got maybe 4 hours of sleep – the tent was smoking hot last night. Right now it’s 24 degrees in the shade and the rising sun is throwing off some serious heat already. Good thing we have around a dozen portages today! From near camp at sunrise, looking up the ‘factory’ falls that is our first long portage of the day. Mexican Hat to Bunny Lake via Jake and East Lunch. We made it to camp with a nice wind on our backs again (!!). The sun just came out for an hour or so but now I see more threatening clouds building up in the west. I wouldn’t be shocked if we get some thunderstorms at some point this afternoon or evening. A nice little waterfall we passed. Today was another great, relaxing day so far with 13 portages and 16 km of travel that we did in about 5 hours thanks to great weather and good spirits! There was some halfhearted conversation about going home already today but I think that one more night will nicely cap the trip. Yet another warm day – chillaxing after a series of hot portages. A good campsite on Bunny Lake. The kitchen area is nicely elevated. The bugs were HORRIBLE though. Harold is out filleting the final lake trout of the trip (who knew we’d catch a lake trout in Bunny?!) on the opposite shore. Rod and I had a good time fishing around for some pike and chatting about life. This has been an outstanding trip on many levels, but especially the weather has been stellar. A new system seems to blow through every 24-36 hours but so far they’ve been mostly harmless and dry. The sunset is shaping up to be a good one, so I’m preparing for one last solo paddle to take some photos of it. Harold solo paddles back after cleaning his Lake Trout. An incredible last sunset of our trip over Bunny Lake. Time for the last night of the trip. I doesn’t feel like 9 nights have passed already, but I do feel ready to go home now. The mosquitos are so brutal tonight in the windless, warm air that I’ve decided to bail on the fire and hit the sack already. It’s the final morning of our trip. Thoughts of work and the “real” world are pouring through my mind, mixed with thoughts of the silent wilderness and song birds currently surrounding me. This trip has taught me some things about myself, some things about life and some things about other people. My last journal entry of the WCPP trip 2011, written on this rock at our perfectly calm and beautiful camp site on Bunny Lake. Heading to Leano Lake, heaving the boats over a beaver dam. 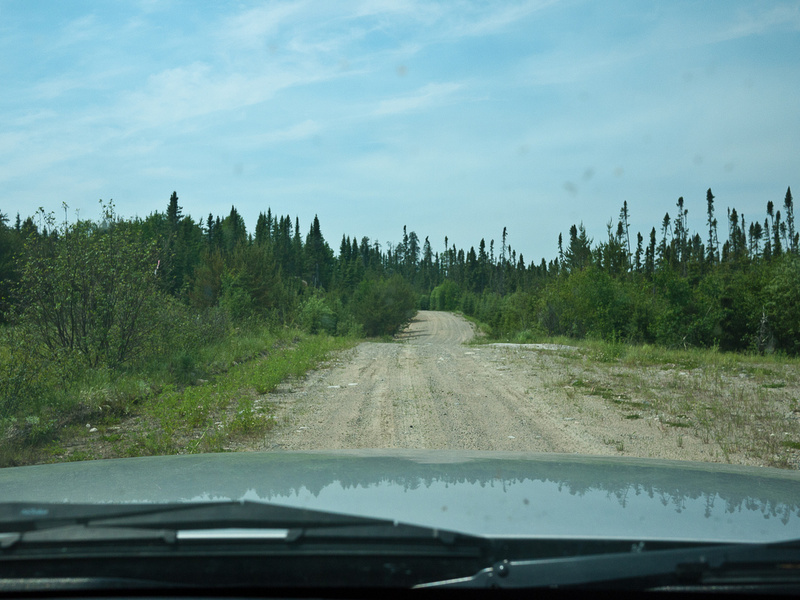 We were rounding the corner to camp within 2 hours of leaving Bunny Lake! I know I will be back in this place in a few years. I’m not sure yet if I’ll be alone or with others but that doesn’t matter much. The wild always calls me back.